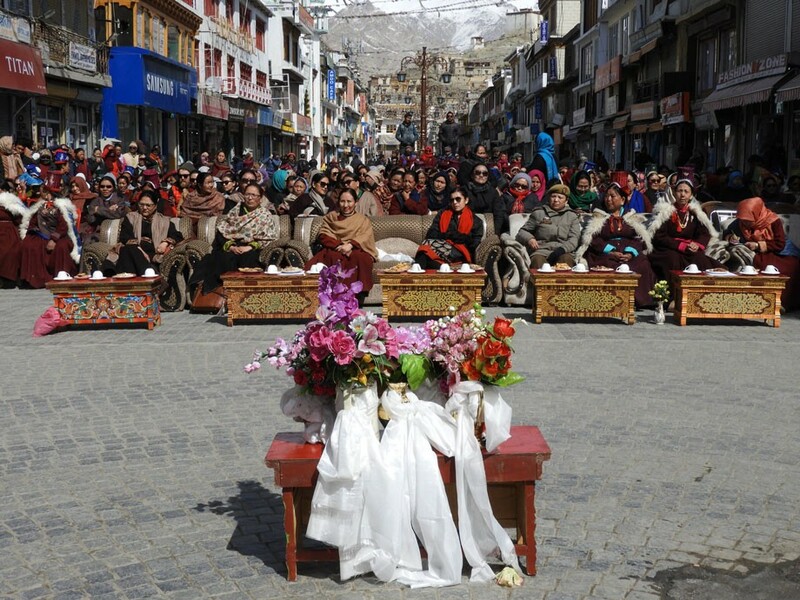 Avny Lavasa and other dignitaries during the International Women’s Day celebration at Main Market, Leh. Celebrating and reflecting the progress made on women’s rights and calling an end to gender inequality, International Women’s day themed, ‘Women Empowerment’ was celebrated with great enthusiasm on March 8 at the main market. It was organised by All Ladakh Women’s Association which includes Ladakh Buddhist Association Women’s Wing, Ladakh Women Welfare Network, Ladakh Women Alliance, Anjuman-E-Imamia Women’s Wing, Christian Women Wing, Anjuman-Moin-Ul-Islam Women Wing, and J&K Cultural Academy Leh. Avny Lavasa, Deputy Commissioner, Leh was the chief guest while Dr. Yangchen Dolma, Retired Chief Medical Officer, Leh was the guest of honour. Avny Lavasa appreciated women’s of Leh for taking action on their promises for progressing Leh forward. She said, “Women’s in Leh plays a greater role in uplifting social issues in Leh including the ban on polythene and clarified that women’s day is not about men versus women rather moving towards a gender-balanced society. She further added that society can progress only if we have a holistic approach and both male and female should work along towards a single goal”. She further requested women to come forward in political representation by exercising their vote in the coming election. Traditional dance performances and a skit on the importance of voter’s right was showcased. Dr. Yangchen Dolma said, “In Ladakh, the male and female ratio in schools, colleges and jobs are equal. But in business and politics, women participation is rare. In a few parts of Ladakh, women remain in their home despite having higher education qualification as they simply look for government jobs. Rather than emphasizing on government jobs, one should challenge themselves to do business, join politics and can also become contractors. “Women have capabilities to work; we should motivate ourselves and have the confidence to achieve the goal. With the celebration of women’s day, there must be an outcome”, she added. She requested all women to ensure the right food habits and discourage the societal system of giving expensive gifts on the wedding which is not a part of Ladakhi culture. Women representatives of the religious organization, NGO’s and departments also spoke on the occasion. Thinlas Chorol, Co-Founders of Ladakh Women Welfare Network of Ladakhi Women’s Travel Agency submitted a copy of memorandum demanding measures and better facilities to ensure safety for the women’s of Ladakh to Avny Lavasa, DC. Development of fully equipped and staffed shelters for women who are victims of different forms of abuse and different circumstances. To develop an empowerment centre where women can learn different skills. Man and Women should have equal opportunities at work and demanded a safe environment for women. Demanded more toilet facilities in Choglamsar and Skalzangling market. An urgent requirement to move wine shops from religious worship places. To take strict action against people smoking in public places. Allocate land to All Ladakh Women’s Association to develop office. Recent women achievers in different fields at various levels were also honored.